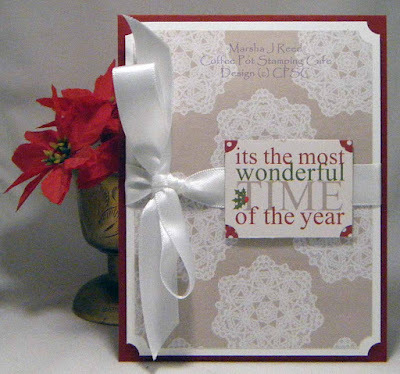 Such pretty colors for this week's challenge over at Christmas Card Challenges. Red, white, beige; they are such nice colors together. Did you notice that I actually did no stamping on my card? The sentiment is from the patterned paper pad I used. Sometimes you don't need ink and stamps to make a pretty card. 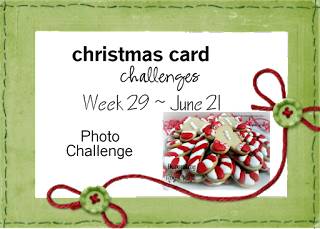 Stamp Set: None; Ink: None; Card Stock: Cherry Cobbler, Santa's List Paper Pad (Teresa Collins); Accessories & Tools: Ticket Corner Punch, 5/8" Whisper White Satin Ribbon, SNAIL Adhesive, Dimensionals. All Stampin' Up!® product unless otherwise noted. The inspiration for my card came from the Christmas Card Challenges Photo Challenge. Show us how you were inspired. We'd love to see what you create!